Two weeks ago, I posted a somewhat angry rant about what had transpired with the Google+ Android App on my tablet, but I think I have to write a kind of retraction as I already mentioned in an update of the original article. 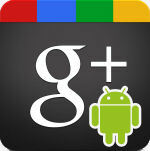 After things went really bad, they got a lot better – there were a couple of updates of the Google+ App in the last two weeks and the current version runs practically perfect now. Has Google really listened to the bug reports and fixed the fatal problem with the edit box? It seems so, because I can now post again without problems with the app and it seems it has become even faster than before. So, kudos to Google for making the Google+ app really useful again – I forgive them, they’re not perfect and make mistakes, but they are always relatively quick fixing them. 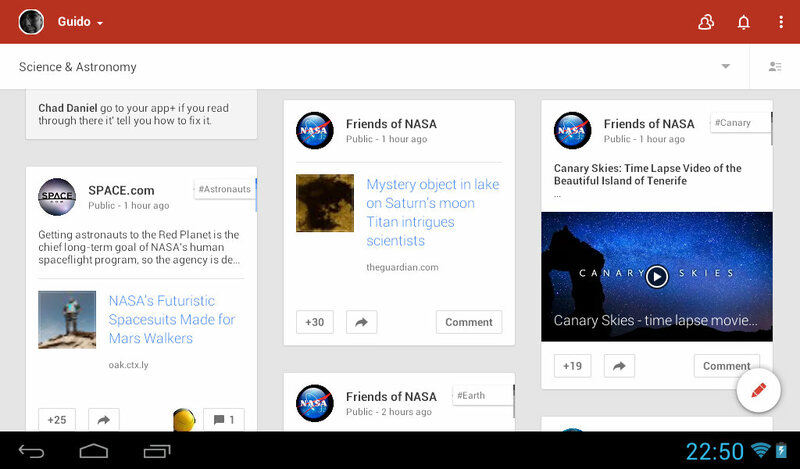 The Google+ App in action – the two top bars seem huge, but they scroll away if you swipe down! There is still one aspect of the Android App and its mobile web counterpart that puzzles me, though: if you start a post from the main screen, you can choose a photo – but only from the highlights or local storage, not from your albums. For that, you have to go to the photo section of the app, choose the image and share it from there . This is not a very big deal, but surprisingly counter-intuitive to the openness of the app from which you should be able to access all of your Google+ content from everywhere. The exclusion of the Albums from the “quick share” option has been in the app from the beginning and seems like a glaring omission – this is, after all, a great tool for photographers who want to share their content and having to make a detour like this feels a little strange, especially because the option is there in the desktop version. Apart from these slight imperfections, the Google+ App has improved so much over the last few months and using it even on a small 7″ tablet is extremely comfortable. Are there other improvements on the way? We’ll have to see – Wednesday and Thursday is the Google I/O conference and there are usually a lot of updates around the corner. It’s entirely possible that the web interface of Google+ gets revamped again like it happened last year. Stay tuned, and don’t panic if something looks different :-).